Видиозапись семинара, проведённого генеральным директором НПО ПАС С.С.Пустынниковым 15.03.2016 в рамках выставки MIPS-2016, на тему: "Dukare 1230 ─ полноценная альтернатива Novec 1230. К вопросу о минимальной огнетушащей концентрации хладона ФК-5-1-12 и методах ее определения." Компания «НПО Пожарная автоматика сервис» представляет вашему вниманию полноценную альтернативу NOVEC 1230 – газовое огнетушащее вещество Dukare™ 1230. Данные составы имеют одинаковую химическую формулу, а как следствие одинаковые физико-химические свойства и эффективность. Преимуществом Dukare™ 1230против NOVEC 1230 является более низкая стоимость при таких же характеристиках, что важно для собственника объекта. In the recent 50-60 years the development of automatic gas fire extinguishing systems (AGFES) was associated exclusively with the progress in the area of chemical synthesis and industrial development of new fire-extinguishing agents. The first AGFES were carbon-dioxide-based. In the 60s, due to the rapid development of computers and construction of computing centres, the problem of protection against fires has arisen. This problem has been successfully solved by development and implementation of gas fire extinguishing agents of the new generation - freons, in particular bromide freons 114B2 and 13B1. Freon 114В2 became widespread in the former USSR. Freon 13В1 has been used predominantly abroad. The period of application of the bromide freons continued till, in 1987, the UN countries, including the USSR, have signed the Montreal Protocol to limit the production and use of substances that destroy the ozone layer of the Earth. The restriction, among the other substances, hit the fire extinguishing bromide freons 114B2, 13B1 and 12B1. At the end of the century the production of bromide freons was widely stopped. To replace the ozone-depleting freons in Russia and abroad the environmentally friendly fire extinguishing freons with zero destruction of atmospheric ozone were synthesized. These are well known and proven freons 125 and 227ea. We must, however, note that the effectiveness of these freons was less than the effectiveness of freons, containing the bromine in their molecule. Another disadvantage of the new freons was the high global warming potential. The latter fact has stimulated the development of such GFEA, which would be free from these deficiencies. At the turn of the centuries the American company "3M" has developed the process and patented freon FK-5-1-12, which was released to the world market under the brand name NOVEC 1230. Synchronously with that the relevant information on the new freon has been included to the American standard NFPA and international standard ISO. At the same (and this is important) the minimum and estimated fire extinguishing concentration values have been established at the level of 4.5 and 5.9 % vol. respectively. 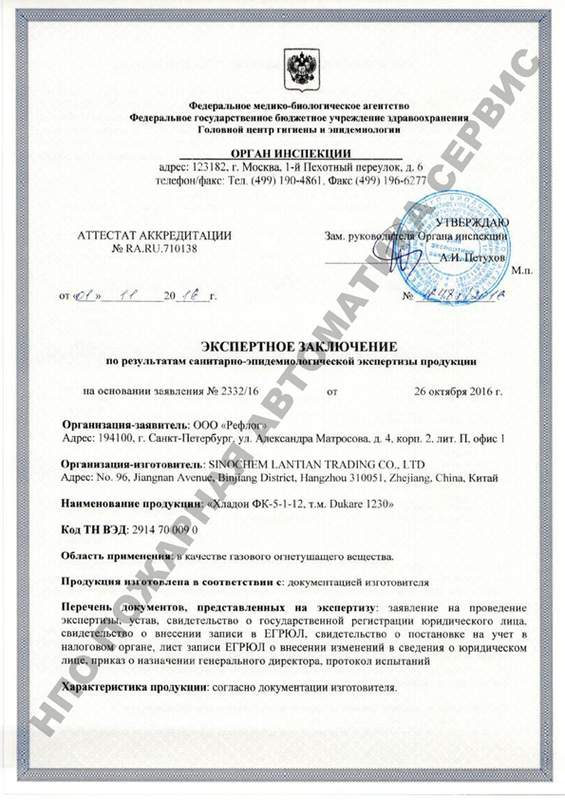 Freon FK-5-1-12 under the trate name "NOVEC 1230" was channelized onto the Russian market, thanks to the vigorous activity of "Pozhtechnika LLC" as on official distributor of "Tyco Fire and Security" company. 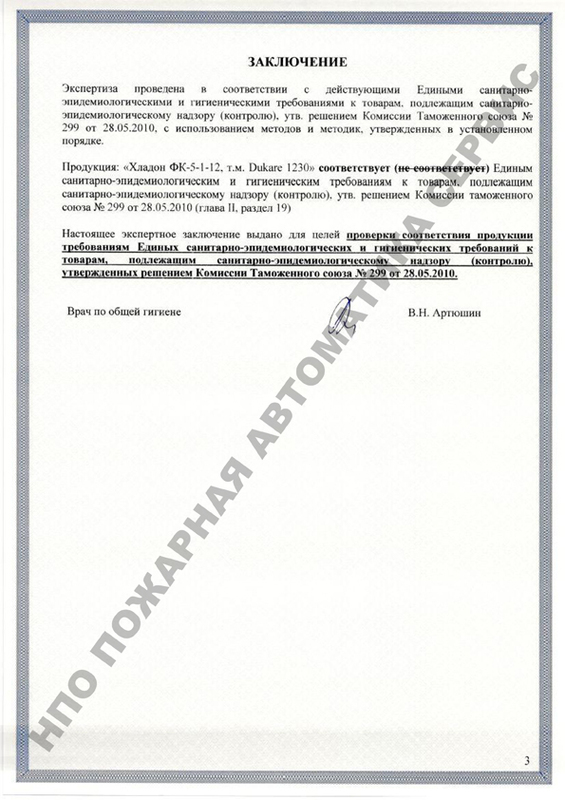 In 2005, on the initiative of "Pozhtechnika LLC", the government authority VNIIPO of Emercom of Russia has developed "Recommendations for the design of gas fire extinguishing installations based on NOVEC 1230 gas fire extinguishing agent". The most remarkable and amazing at the same time is that the value of fire extinguishing concentration in this document was established at the level of 3.4% vol. It is easy to see that this concentration is 70% less than in the NFPA and ISO standards. It is an obvious and glaring mistake. It may be absolutely certainly said that gas fire extinguishing installations, designed with consideration of such low concentrations, are very far from the recognition as effective ones. How many such installations was duplicated for the duration of these recommendations is hard to say. Obviously not one dozen. Only four years later, namely in 2009, Pozhtechnika LLC released its own enterprise standard, where the fire extinguishing concentration was fixed at the level of 4.2 vol. %. What can we say: the correction was necessary, but not sufficient. However this correction has changed nothing fundamentally. It is still too low to ensure the unconditional fire extinguishing and is still 40% below the concentration recognized abroad. 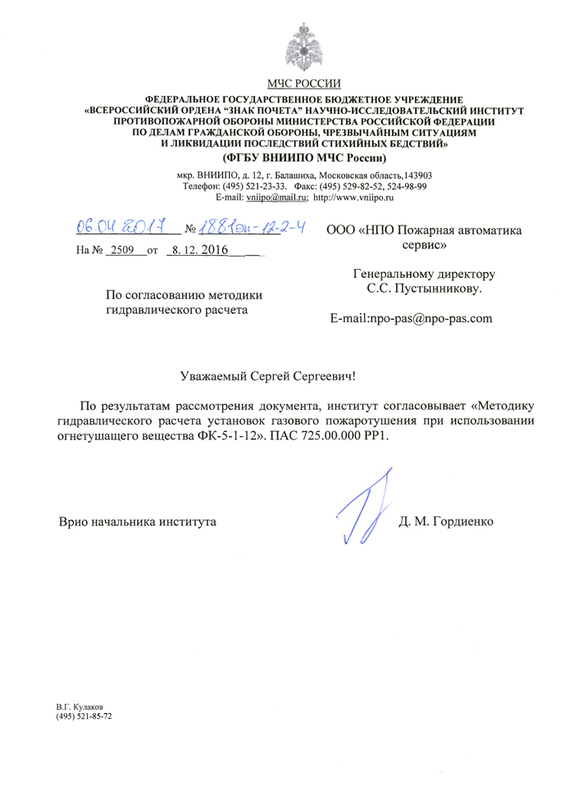 Nevertheless, this fact did not prevent VNIIPO of Emercom of Russia to review the above standard of Pozhtechnika LLC and find no objections to its use. On the initiative of VNIIPO of Emercom of Russia document was further reviewed at the Standard and technical Council of the Department of supervision of Emercom of Russia and was granted a positive conclusion. 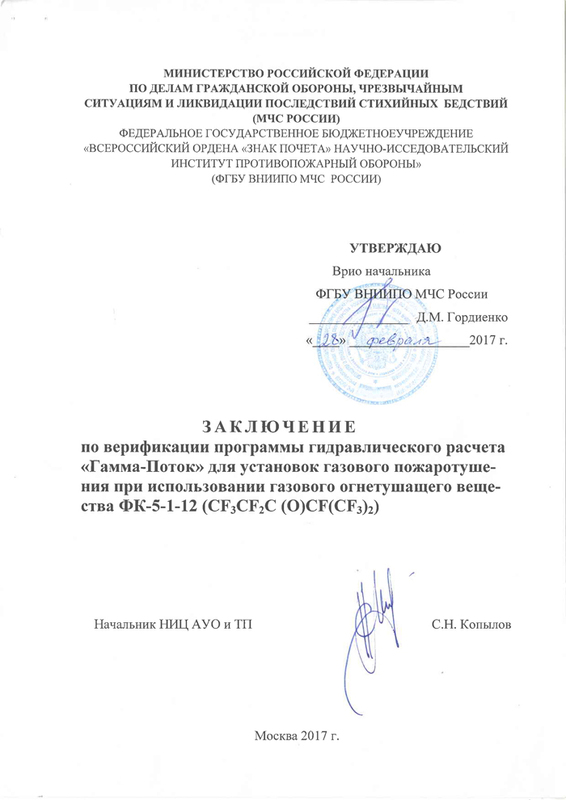 Moreover, NVPS of Emercom of Russia found it necessary to prepare and make the appropriate changes in SP-5.13130.2009 in part related to the use of freon FK-5-1-12. The actions soon suited the words. The Rulebook SP-5-13130 using the change procedure the new extinguishing agent FK-5-1-12 was included. The only thing that these changes did not touch upon was the ill-fated standard concentration. It has remained at the same level of 4.2% vol. So from year to year this fatal error roams from one standard document to another, without undergoing any fundamental changes. And, as a result, more and more ineffective gas fire extinguishing installations using freon SP-5-1-12, which is the essence of NOVEC 1230, are commissioned in Russia every year. In 2014 the patent protection of freon FK-5-1-12 has expired. This circumstance has made it possible for one of the Chinese manufacturers to start producing this freon at the own enterprise. The new product has got a trade name "DUKARE -1230". Taking advantage of this opportunity NPO "Pozharnaya automatika service" LLC purchased 500 kg of this product with a view to explore its fire extinguishing effectiveness. We addressed to VNIIPO for the decision. Two series of experiments have been conducted to identify the minimum fire extinguishing concentration in two ways: using the "Cylinder" and "Total Flooding" methods. The method of "Cylinder", where the freons NOVEC-1230 DUKARE-1230 have been compared, showed their complete similarity in terms of fire extinguishing efficiency. Both products have ensured the extinguishing of the flame of standardized fire source with a minimum fire extinguishing concentration of 4.5% vol. Testing using "Total Flooding" method provided negative result in all the experiments with concentrations of 4.5; 4.52; and 4.9% vol. The result was more than predictable, because with jet dispersing under the conditions of test chamber it is not possible to achieve full evaporation of freon FK-5, which is a liquid under normal conditions. Thus, it may be concluded that the "Total Flooding" method is not applicable for determination the minimum fire extinguishing concentration of liquid gas fire extinguishing agents. At best, it is suitable to verify the regulatory fire extinguishing concentration, which in this case should not be less than 5.4% vol. These data confirm the earlier results of fire extinguishing of standardized fire source in the confined area. Successful fire extinguishing may be achieved at concentration of at least 5% vol. Nevertheless, based on the tests conducted OJSC Malakhit ceased to consider freon FK-5-1-12 as a prospective agent for its facilities. Standard fire extinguishing concentration of freon FK-5-1-12 established by Rulebook SP-5-13130.2013 is currently established at 4.2% vol. This is a mistake which should be corrected as soon as possible, by making appropriate changes to the document. The correct value of the standard fire extinguishing concentration shall be at least 5,4 % vol. The "Total Flooding" method is not suitable for experimental determination of minimum fire extinguishing concentration of freon FK-5-1-12. For this purpose, the "Cylinder" method siuts best, however, this method requires changes in GOST R 53280.3. Freons under the trademarks NOVEC 1230 and DUKARE 1230 are identical across the entire spectrum of physical-chemical and fire extinguishing properties. In terms of international classification both products refer to freon FK-5-1-12. Thus, we may say that the monopoly of NOVEC 1230 has ended. DUKARE 1230 has become its full-fledged alternative. 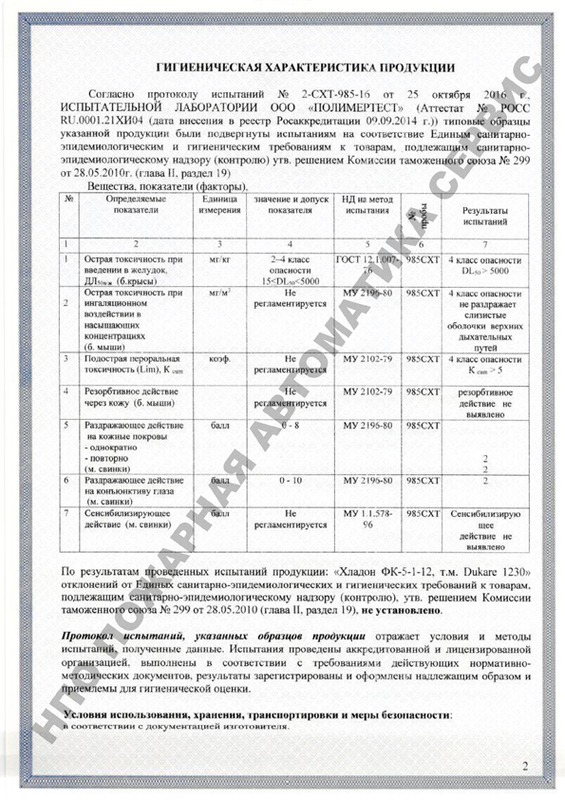 At the present time VNIIPO of Emercom of Russia has prepared draft final edition of SP 5.13130 rulebook in part relating to standard volumetric fire extinguishing concentration of freon FK 5-1-12. According to this draft it amounts to 5.4 % vol. Последние 50-60 лет развитие автоматических установок газового пожаротушения (АУГП) было связано исключительно с прогрессом в области химического синтеза и промышленного освоения новых огнетушащих веществ. Первые АУГП были углекислотными. В 60-е годы прошлого столетия, в связи с бурным развитием ЭВМ и строительством вычислительных центров, встала проблема их защиты от пожаров. Эта проблема была успешно решена за счет разработки и применения газовых огнетушащих веществ нового поколения – хладонов, в частности, бромхладонов 114В2 и13В1. Хладон 114В2 получил широкое распространение в СССР. Хладон 13В1 использовался преимущественно за рубежом. Период применения бромхладонов продолжался до тех пор, пока в 1987 г. страны ООН, включая СССР, не подписали Монреальский протокол по ограничению производства и применения веществ, разрушающих озоновый слой Земли. Под ограничение в числе прочих веществ попали пожаротушащее бромхладоны 114В2, 13В1 и 12В1. В конце века производство бромхладонов было повсеместно прекращено. На замену озоноразрушающим хладонам в России и за рубежом были синтезированы экологически чистые огнетушащие хладоны с нулевым показателем разрушения атмосферного озона. Это хорошо известные и зарекомендовавшие себя хладоны 125 и 227еа. Следует, правда, оговориться, что по эффективности эти хладоны уступали хладонам, содержащим в молекуле бром. Другим недостатком новых хладонов был установлен высокий потенциал глобального потепления. Именно последнее обстоятельство стимулировало разработку таких ГОТВ, которые бы были свободны от указанных недостатков. На рубеже веков американская компания 3М разработала технологию и запатентовала хладон ФК-5-1-12, который вышел на мировой рынок под брендом «NOVEC 1230». Синхронно с этим в американский стандарт NFPA и международный стандарт ISO была внесена соответствующая информация о новом хладоне. При этом (и это главное), значения минимальной и расчетной огнетушащих концентраций были установлены на уровне 4,5 и 5,9% объёма соответственно. На российский рынок хладон ФК-5-1-12 под торговой маркой «NOVEC 1230» был канализирован благодаря активной деятельности ООО «Пожтехника» ─ официального дистрибьютора фирмы «Tyco Fire and Security». В 2005 г. по инициативе ООО «Пожтехника» ВНИИПО МЧС РФ разработал «Рекомендации по проектированию установок газового пожаротушения на основе газового огнетушащего вещества «NOVEC 1230». Самое примечательное и одновременно удивительное, что значение огнетушащей концентрации в этом документе было нормировано на уровне 3,4% об. Легко видеть, что эта концентрация на 70% меньше, чем в стандартах NFPA и ISO. На лицо явная, и притом грубая ошибка. Можно с абсолютной уверенностью утверждать, что установки газового пожаротушения, спроектированные с учетом столь низкой концентрацией, весьма далеки от признания их эффективными. Сколько таких установок было растиражировано за время действия указанных рекомендаций, сказать трудно. Очевидно, не один десяток. Только через четыре года, а именно в 2009 г. ООО «Пожтехника» выпустило собственный стандарт предприятия, в котором огнетушащая концентрация была зафиксирована на уровне 4,2% об. Что тут можно сказать: коррекция необходимая, но недостаточная. Хотя принципиально эта коррекция ничего не изменила. Она по-прежнему слишком мала, для того, чтобы обеспечивать безусловное тушение и по-прежнему на 40% ниже концентрации, признанной за рубежом. Тем не менее это обстоятельство не помешало ВНИИПО МЧС РФ рассмотреть указанный стандарт ООО «Пожтехника» и не найти возражений против его применения. С подачи ВНИИПО документ был далее рассмотрен на Нормативно-техническом совете Департамента надзорной деятельности МЧС России, и по нему было выдано положительное заключение. Более того, ДНД МЧС России посчитал необходимым подготовить и внести соответствующие изменения в СП-5.13130.2009 в части, касающейся применения хладона ФК-5-1-12. Сказано – сделано. В свод правил СП-5.13130.2009 в порядке изменения было внесено новое огнетушащее вещество ФК-5-1-12. Единственно, чего эти изменения никак не коснулись – это злополучной нормативной концентрации. Она как была 4,2% об., так и осталась на том же уровне. Так и кочует из года в год эта фатальная ошибка из одного нормативного документа в другой, не претерпевая при этом никаких принципиальных изменений. И, как следствие, в России все больше и больше ежегодно вводится в эксплуатацию неэффективных установок газового пожаротушения с применением хладона ФК-5-1-12, суть « NOVEC 1230». Испытания по методу «Объемной подачи» дали отрицательный результат во всех экспериментах при концентрациях 4,5; 4,52; и 4,9% об. Полученный результат был более чем предсказуем, так как при струйном диспергировании в условиях испытательной камеры невозможно добиться полного испарения хладона ФК-5-1-12, который при нормальных условиях представляет собой жидкость. Таким образом, можно сделать вывод о том, что метод «Объемной подачи» для определения минимальной огнетушащей концентрации жидкостных газовых огнетушащих веществ не применим. В лучшем случае, он годится для проверки нормативной огнетушащей концентрации, которая в нашем случае должна быть не менее 5,4% об. Приведенные данные подтверждают полученные ранее результаты по тушению модельных очагов в закрытом объеме. Уверенное тушение может быть достигнуто при концентрации не менее 5,0% об. Тем не менее, на основе проведенных испытаний ОАО «Малахит» перестало рассматривать хладон ФК-5-1-12 в качестве перспективного для своих объектов. Нормативная огнтушащая концентрация хладона ФК-5-1-12 установленная сводом правил СП-5-13130.2013 составляет в настоящее время 4,2% об. Это ошибка, которую следует как можно быстрее исправить, внеся в документ соответствующие изменения. Правильное значение нормативной огнетушащей концентрации должно быть не менее 5,4% об. Метод «Объемной подачи» для экспериментального определения минимальной огнетушащей концентрации хладона ФК-5-1-12 не пригоден. Для этой цели лучше подходит метод «Цилиндра», однако для использования этого метода требуется внесение изменений в ГОСТ Р 53280.3. Хладоны под торговыми марками «NOVEC 1230» и «DUKARE 1230» идентичны по всему спектру физико-химических и огнетушащих свойств. По международной классификации оба продукта относятся к хладону ФК-5-1-12 и имеют одинаковый CAS номер #756-13-8 Таким образом, можно говорить о том, что монополия на «NOVEC 1230» закончилась. «DUKARE 1230» стал его полноценной альтернативой. В настоящее время ВНИИПО МЧС России подготовил проект окончательной редакции свода правил СП-5.13130.2009 в части, касающейся нормативной объемной огнтушащей концентрации хладона ФК 5-1-12. Согласно подготовленному проекту она составляет 5,4% об.